Today I’m pleased to bring you a Q&A session with author Terry John Malik, whose new novel The Bricklayer of Albany Park asks the age-old question: Does it take a monster to catch a monster? Thomas Aquinas Foster is one of the driving forces of the novel, and an incredibly complex character. What inspired you to begin writing about him? Father-son relationships. While in college, Vincenti asks Foster, “Does it take a monster to catch a monster?” So, who’s the real monster in this story? My main focus had always been Detective Vincenti. Sons of alcoholic or abusive fathers often spend their entire lives searching for the “good father.” Seldom do they find one. Did Vincenti become a cop to catch murderers or to please his surrogate father, Foster? You’ve also worked as a teacher previous to beginning writing. Did this experience help you at all in writing either Vincenti or Foster? I’ve always been interested in storytelling. As an English Literature major at Notre Dame I came to appreciate a story well told. Teaching English to teenagers fueled my love of simple characters who moved lives and events in unanticipated directions. As a lawyer I was taught to grab the attention of judges in legal briefs by weaving a good story to open my argument. Was The Bricklayer of Albany Park inspired by any true events/people? my old neighborhood and parish. I gave Francis an Italian last name because the neighborhood around Newland and Grand Avenue, is heavily Italian, Irish and Polish. It is the neighborhood where I grew up. I placed his house and garage on 2538 Newland Avenue, which is the parking lot of my childhood parish, St. William. The description of Vincneti’s house, a typical Chicago bungalow, is actually my wife’s Italian grandparents’ house and garage. It’s located at Oak Park Avenue and Grand Avenue—three blocks west of 2538 Newland. There are some tidbits I planted in the book for the true-crime, serial-killer aficionados. The address for Henry’s apartment house on West Summerdale is actually the address of John Wayne Gacy, the Killer Clown. White Shutters Lounge is the place where John Matheny of Baltimore found his victims; he killed eight women, was a cannibal and inspired Harris’s Hannibal “the cannibal” Lecter. The Borderline Pub is the bar where Gary Ridgeway, the Green River Killer, picked up young girls and then murdered them; Ridgeway drove a Toyota pick-up with a primer paint spot on the passenger-side door—it’s how a witness identified him. Ridgeway confessed to killing forty-eight girls (police say it’s more like ninety). How did you start writing? Was it a life-long dream? 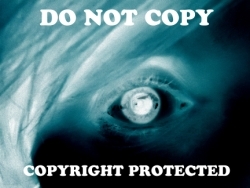 Prior to November 2014, I had never written a word of fiction, although some judges mistakenly claimed I did. So, how did I get here? Polite friends have called it an “odyssey.” I call it, “well-timed accidents mixed with equal measures of luck, unintended consequences and serendipity.” After having lived my entire life in Chicagoland, my wife and I moved to Sanibel Island in 2012. I wrote six paragraphs that were, well, edgy and dark. The next morning we were required to stand in front of the class and read what we had written. The offerings were critiqued by the class, and the instructor. I read. First, a moment of silence, then applause?! When the applause died done, the instructor said (really), “Holy crap, I want to see the rest of that manuscript.” Huh? That’s it, buddy. Six paragraphs. I went home and told my wife, Cathy, what had happened. She said, “So, write the damn book.” Thus, the birth of The Bricklayer of Albany Park. Like I said—well-timed accidents mixed with equal measures of luck, unintended consequences and serendipity. What was the most difficult part of writing this novel? 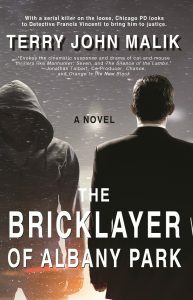 The most difficult was getting into the heads of Detective Vincenti and Anthony, the Bricklayer. I had to keep doing the research as I wrote/revised/wrote/revised again. I tried to avoid flowery language, long sentences and excessive use of adverbs and adjectives. I had to keep reminding myself to keep it simple, stupid. Did the book require a lot of research, or did you have enough know-how from your various jobs that it was a fairly simple process? Bricklayer took nine months to write, during which I conducted untold hours of research. My typical day of writing started early morning, right after sunrise. I critically read what I had written the day before, which usually took about an hour. Having finished the re-read and my first cup of coffee, I then conducted about two to three hours of research, two hours of rewriting the previous day’s work and only about an hour of writing new text. I stopped for the day around four o’clock and, like Foster, enjoy a glass of Irish whiskey after which I went back and read the last three or four chapters to make sure it all flowed, and then another glass of Irish. 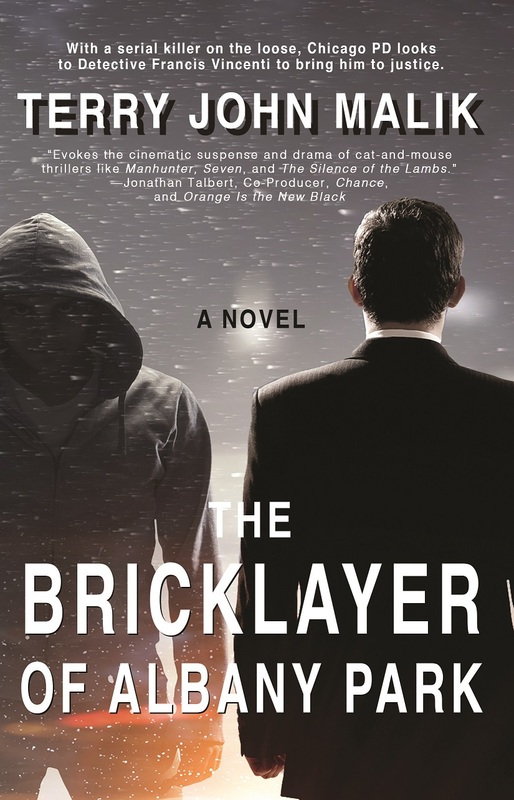 Do you have a favorite character from The Bricklayer? Vincenti. He is a victim of his father, of Foster and ultimately of himself. As a student, Francis Vincenti asked his mentor, former Chicago PD detective Thomas Aquinas Foster, if it took a monster to catch a monster. Foster, a man with a tortured soul and his own self-righteous brand of justice, didn’t have an answer. Now a detective with a string of famous arrests under his belt,Vincenti is known as a cop with an uncanny insight into a killer’s psyche. Until the Bricklayer of Albany Park. Obsessed with the brutal slayings, Vincenti studies the murderer and his victims, reconstructing the killings and burials by day and, at night, recreating the murders one by one in his nightmares. He knows the Bricklayer. But not well enough to stop him. As a native-born Chicagoan, Terry John Malik brings his city to life in vivid detail. Malik majored in English at the University of Notre Dame, and taught English for several years in the Archdiocese of Chicago School System. An alumnus of Loyola University School of Law, he practiced law for twenty-eight years appearing in federal courts across the nation. In addition, he served as head master of a high school and administered a foundation that provided scholarships for disadvantaged inner-city girls. Throughout the years, Malik continued to hone his writing skills. 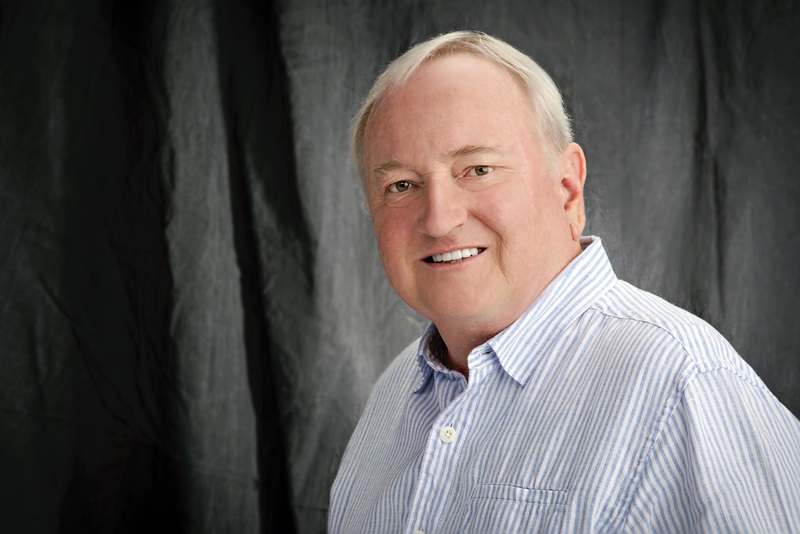 Terry and his wife currently reside on Sanibel Island, Florida, where he is working on the sequel.